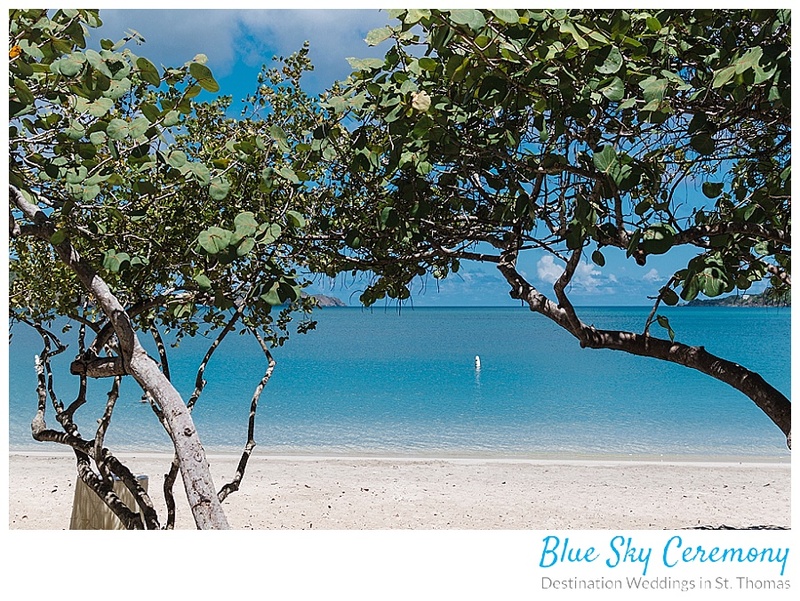 If you are looking for that perfect beach wedding venue in St. Thomas, Magens Bay might be the best stretch of white sand in the Caribbean for weddings. Magens Bay Beach weddings always look amazing. The beach is well known for its smooth, clear waters, majestic palm trees and powder-like white sand. But wedding planners and brides treasure this wedding location for many other reasons. The beach itself spans a generous .8 miles. So it is easy to find a quiet place to get married. 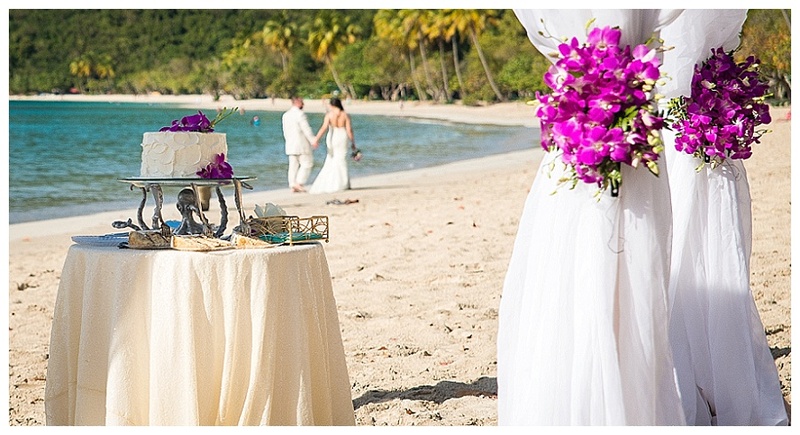 No resort or beach in St. Thomas offers more choices for holding a wedding ceremony. The beach has all the amenities required for executing the simplest or most elaborate wedding. Beach houses are located on both ends of the beach with adequate changing space (these are not luxurious by any stretch) for getting into and out of your wedding dress. They also have open air showers if you need a quick rinse after trashing your dress! Four covered pavilions/sheds dot are scattered along the beach. The pavilions are great if you want to have a DJ or a fully catered reception as they provide not only cover from the elements but also electrical power outlets. A full-bar serves up beer, liquor and frozen drinks if you opt to not have an open bar. There is also a grill with basic menu items like chicken sandwiches, pizza and burgers. A small gift shop next to the bar offers beach chair rentals, swimwear, towels and water toys. So if you plan on making your post-wedding party a day at the beach, you have everything you need to make it a blast! As a wedding venue, Magens also shines when it comes to staging your photography. Whatever your inspiration for your beach and island photos, this location can make it happen. As mentioned, the beach and water is glorious. 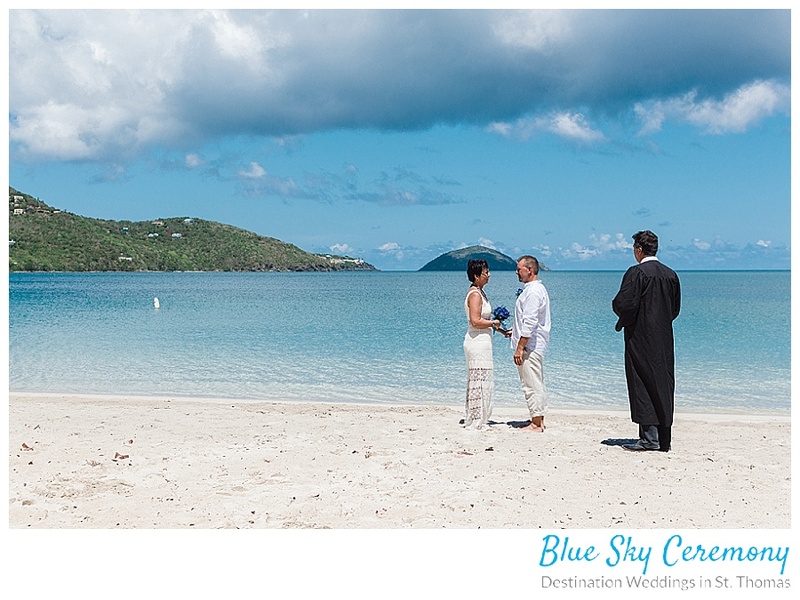 While saying your vows, the background will be the blues and greens of the sea. Just past the opening to the bay is an island that will add a lovely element to your shots. Because the water is so calm at Magens, trashing your dress in the water is a fun and safe way to end your photo shoot. Just off the beach is a path through a coconut grove. After getting your beach pictures taken, head into the lush tropical landscape for some unique photos. The trail into the grove is well-maintained and leads to some old ruins. Magens Bay Beach is well-maintained by the park services and therefore requires an event fee and entrance fee. The site fee for a wedding or vow renewal is $100. The site fee covers the entrance fee for the couple and two guests. Each additional guest must pay $4. Magens also is convenient when it comes to transportation for you and your guests. Taxi service is readily available from the beach. Even if you and your guests have rented cars, it can add a level of excitement and enjoyment to arrange for all of your guests to arrive on an open-air safari taxi. 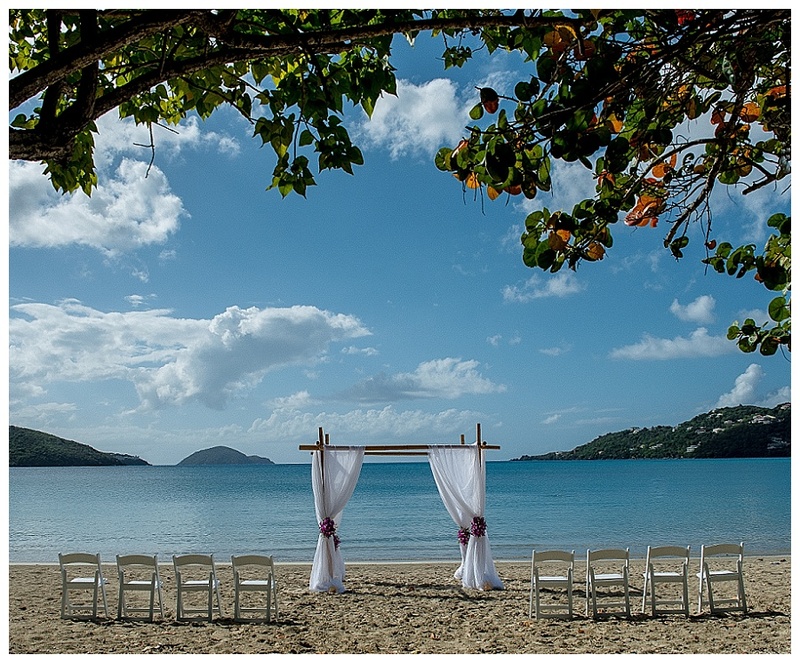 In short, if you are looking at places to get married in St. Thomas with your toes in the white sand, Magens Bay Beach should be on your list of possibilities.